Ok, so my rewritten Beatles lyrics don’t quite fit the music. But it’s a small blessing in disguise that the dress did have to wait, because it would otherwise fall into the oh-so-frustrating category of “things I should be able to wear while nursing, but can’t.” Like all but two of the button-down shirts I own. On the other hand, my larger-than-usual measurements did prove challenging at times. I probably should have made a muslin. But since I have to fight for every second of sewing time these days, it’s hard to stomach the thought of not having anything to show for it in the end. 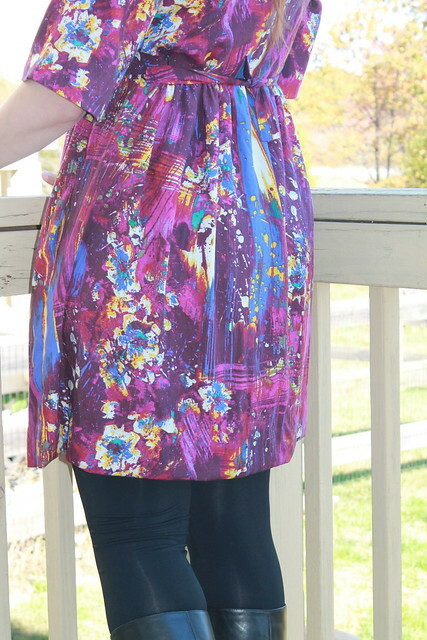 When I originally planned to make the Darling Ranges dress, I was going to make it in a medium. I had to bump that up to a large, but thankfully, I still had enough fabric. Barely. The biggest challenge, and one that took me a couple of naptimes to sort out, was fitting the bust darts. They’re oddly wide on the pattern, which should have been a hint to me that this might need some work, given how much effort it took me to sort that out when attempting to come up with an FBA for the Cambie dress back in the wedding sewing days. Since I didn’t want to waste this gorgeous fabric, I had to resort to lengthening the dart and kind of curving it in on the ends, because the original was leaving me with some very unflattering, saggy points. In this picture, the top diagonal line is the original dart. The lower line is how far out I had to drag it to make it work. I’m not entirely sure how I feel about this dress, to be honest. On the one hand, I love love love this fabric. And there’s something rather delightfully 90s about it, which is probably the fact that it’s kind of babydoll and in a challis. But at the same time, I feel like this pattern would need quite a bit of work to get it where I would want it to be. Aside from tweaking the bust darts, it feels like the waist needs to be lowered about an inch or so in order to hit my natural waist. As it is, it’s hitting this odd spot between that and an empire waistline. The ties would need to be longer to accommodate my current embiggened state. I wasn’t happy with the front placket construction, since the lack of interfacing made it so my normally compliant machine gave me hell on the buttonholes, despite using paper underneath to try and compensate. And I do have some odd gapping on just one side of the neckline that I couldn’t quite work out. The one tweak I did make was to the length of the sleeves, cutting them down to just above my elbow instead of the 3/4 that they originally were. With the busyness of the print, I think that was the right move, so thanks to everyone I polled on Instagram/Twitter who helped me make the decision. So I guess the question is, do I care enough about this pattern to put the work into altering it? I’m not sure yet. I’ve seen one variation that Megan Nielsen made where the waist seam and gathers were eliminated to make it more like a button-down tunic, and that style looks like it would be lovely for a particular piece of fabric that’s been in my stash for quite some time. But I would definitely need to reconcile that dart situation first, and I wonder if I’d be better off waiting until I have some time to play with a few other button-down patterns in my stash. Also, here’s my shot for this month’s installment of the Better Pictures Project, just under the wire. This month’s focus was on action shots. None of my spinning ones turned out well–I just couldn’t seem to get the timing down between when I was moving and when Doug was actually pressing the shutter button. So I went with my daily weightlifting instead. And I know this particular shot would have been better if the flash hadn’t gone off and left me with that shadow. But hey, cute baby accessory. Since it took me this long to get a day where the light cooperated and I didn’t have to try to juggle Hobbit and the tripod on my own, I actually managed to (mostly) finish my other two FESA projects! So more on those next time. I think the fabric is lovely, so I understand the disappointment in not having the dress you envisioned. Especially since it’s been so long in the making (or planning). I just realised that my waist sits pretty low so all patterns and RTW with a waist seam or belts end up in that weird spot, I never gave it much thought Before, but now I can’t stop thinking about it when I wear those things. I hope you can make your dress work, however I have no ideas to share. And BTW, look how big Hobbit’s getting! It’s ok to wear, but the pattern would definitely need tweaking if I use it again. And he’s gotten really tall all of a sudden. The pediatrician said at his last appointment that he’s taller than 85% of the boys his age! We’ll see if he stays there..